Plans to ‘take apart and rebuild’ a historic bridge linking England and Scotland have been approved by Northumberland County Council – and its Scottish counterpart. At last Thursday’s (March 21) meeting of the North Northumberland Local Area Council, members unanimously approved an application for listed building consent for essential conservation and structural repairs. The planning officer’s report explained: ‘The condition of the bridge is poor and is listed on the national Heritage At Risk Register. The repairs are very extensive, with seven mechanical elements requiring removal, cleaning, inspection, repair or replacement, and a further four non-mechanical pieces needing repair and alteration work. 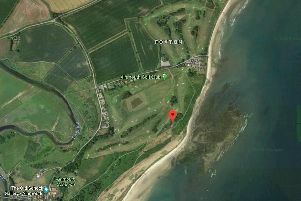 However, the bid was supported by both Northumberland County Council’s conservation officers and Historic England, subject to conditions. Given that the application covers land in both England and Scotland, applications were made to both local authorities, with Scottish Borders Council approving the scheme the previous night (Wednesday, March 20). 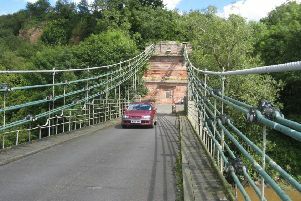 In March last year, a first-round National Lottery Heritage Fund (NLHF) bid by Northumberland County Council, Scottish Borders Council, Museums Northumberland and community group Friends of the Union Chain Bridge to restore the famous structure completely, secured a £360,000 development grant. That meant the £7.3million project could move into the development, ahead of a second-round submission to the NLHF, which will now be made by the end of May. The wrought-iron structure was designed by former Naval captain Samuel Brown and, at the time of completion in 1820, was the longest single-span iron suspension bridge in the world at 449 feet in length. Until 1885, a toll had to be paid upon crossing – with toll-houses located at both ends. The still-standing Scottish toll-house additionally held a licence to sell whiskey and conduct wedding ceremonies. The English toll-house was demolished in 1955 with the approximate outline of its walls still marked out by concrete kerbstones. The structure was the first vehicle bridge of its type in the world and to this day is the oldest of its type to still carry regular vehicle traffic. Brown’s patented chain-link system was pioneering at the time it was developed and the Union Bridge is one of the few remaining structures with the original chains intact.